CAMP HANSEN (9/13/2012) — Captains Aaron F. Fisher and Christopher M. Kaprielian were awarded Bronze Star medals during a ceremony at the 9th Engineer Support Battalion physical training field at Camp Hansen Sept. 5. Fisher served as the company commander of Engineer Support Company, 9th ESB, 3rd Marine Logistics Group, III Marine Expeditionary Force, and Kaprielian served as the operations officer of 9th ESB during its recent deployment in support of Operation Enduring Freedom. They were awarded the medals for meritorious service during their seven-month deployment in support of OEF. Fisher organized his company to accomplish all assigned missions and to succeed in a highly challenging environment. His company played a key role in the completion of more than 45 different engineering projects including more than 60 kilometers of new route construction, survivability improvements, patrol base development and enhancement, combat patrol security and general engineering efforts at outposts across Helmand province. Kaprielian planned and provided oversight for the construction and engineering projects performed by the battalion. 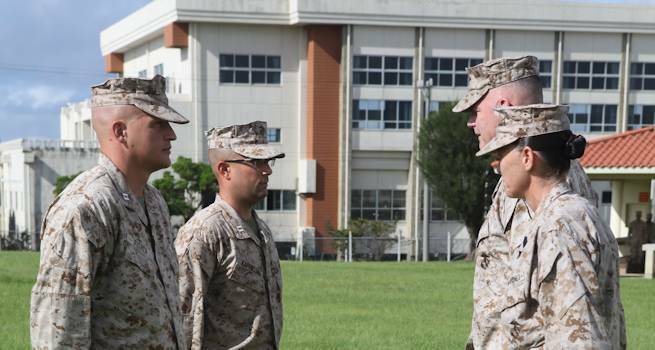 Kaprielian managed the battalion's assets to ensure the engineers were able to meet the commander's expectations and achieve mission success. Fisher led several important projects, but commanded two critical and especially challenging missions. His company constructed a land bridge, known as Route Red Wadi Crossing, to ensure the main supply route remained open following the winter thaw. Additionally, his company built Route Tiffany providing a resupply access route to a remote forward operating base. Although the two Marine leaders felt a sense of pride in receiving Bronze Stars, they both agreed that it was because of their Marines' efforts that their units accomplished so much.